Kevan Ohtsji, originated from Japan has always lived in Canada with his family. He began his actor career as a teenager out of necessity to be understood. He fights to open the eyes of the narrowly focused and to give the same chances to all the actors no matter their ethnic origin. 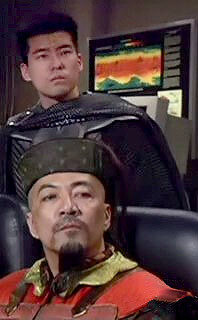 Kevan is known by the Stargate fans as Oshu, the Prima of Lord Yu. He played in 5 episodes until now. He also played in movies such as Elektra and Crying Freeman, his first job as an actor. Gilles Nuytens: Hello kevan, how are you? Can you talk a bit about you, what led you to begin the actor career? Kevan Ohtsji: I began my acting career a teenager out of necessity to be understood. Exploring emotions and the ability to release them in performance excited me. After the initial steps, I decided to begin my studying on a more professional level. Today I have a more philosophical grounding in my film work with the driving force being a desire open the eyes of the narrowly focused. I hope to have the privilege of being part of projects that challenge and celebrate the human spirit. Gilles Nuytens: What do you most enjoy in that job? Kevan Ohtsji: Those moments of perfection when you can feel a real connection and understanding with the other actor in a scene. When that happens, there is usually a mutual respect within all the cast and crew sharing in the experience. It's a difficult experience to articulate into words, but a very powerful and rewarding moment. I also love meeting writers and directors who dedicate and give their all, putting their blood, sweat, tears and soul into the work. It's something you can just feel in your gut. And more often than not, productions like these unveil gems of magical moments both on and off screen. Gilles Nuytens: You would like to have a role in a big drama movie. Is there a particular character you would like to play? What would be THE role of your career? Kevan Ohtsji: If I had to choose THE role of my career, it would have to be that of a samurai in ancient Japan. Close seconds would be to play a lawyer, and a WWII soldier. 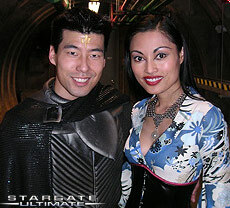 Gilles Nuytens: You played in 5 episodes of Stargate SG-1; what were your best memories on the set? Kevan Ohtsji: I remember stepping into my trailer after blocking a scene, closing my eyes and giving thanks for a role that I believe embodied the soul of my reason to becoming an actor. With my costume I would take up to 10 minutes to go the washroom, and I would need assistance from wardrobe to put on and take it off. I had to limit coffee consumption. Another memorable moment was doing a scene with Torri Higginson where Oshu begged, "Free us to fight, or let us die with honor." She was fantastic to work with and a real gem of an actor. Also Martin Wood cracked me up when after each scene he would yell " and.CUT!" with a giddy enthusiasm. You had to be there. 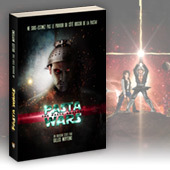 Gilles Nuytens: You character in that show is closely related to Lord Yu, played by Vince Crestejo. How was it to work with him? What kind of people is he ? Kevan Ohtsji: Vince was total pleasure to work with. He was very down to earth and always happy ­ it really made for a wonderful working environment. Lord Yu commands such a dignified respect and one to be feared, but outside of filming Vince is just the nicest guy and would always be cracking jokes. Gilles Nuytens: My favourite question: do you have a funny anecdote from the sets you would like to share with us ? Kevan Ohtsji: Someone blew a fart, a real stinker. Gilles Nuytens: Last time we saw you in Stargate (episode "Reckoning, part 1"), Lord Yu was just stabbed by the "twin" of Sam Carter. At the end, we do not know what happened to your character because the scene ends there. Do you think he is dead? If it is not the case, do you have some clues about his faith and if we will see you again in season 9? Kevan Ohtsji: I believe Oshu is still alive, and I would believe that his faith would be deeply shaken but his people are the most important and he would sacrifice anything for their survival. He is deeply a creature of honor and valor. So far I haven't shot anything since, so to be honest I don't know if he'll be coming back or not, but I'd have to say that in my career he was my favorite character to play. Gilles Nuytens: During the last years the Japanese culture gain some interest by the occidental youth mainly with the growing popularity of mangas and Japanese cartoons. The phenomenon began in Europe then gained the United States. Has this fact impacted your career ? Kevan Ohtsji: Japanese manga gave rise to very first role in the film version of the popular manga, Crying Freeman. I think the world as a whole is more conscious of itself and its wonderful diversity and I believe that more films are being made that reflect truer representations of all cultures and societies than ever before. Gilles Nuytens: What are your future projects ? Kevan Ohtsji: Future projects have included television, animation, video games, film and indie film alike, but my current future project would have to be myself writing a screenplay set in ancient Japan. Gilles Nuytens: Which models have influenced your career? Kevan Ohtsji: There are so many greats to draw from, but to narrow it down I would have to say Al Pacino, Robert DeNiro, Oliver Stone, Wong Kar Wai, Steven Soderberg, Anthony Hopkins, and Marlon Brando. Gilles Nuytens: If you did not become an actor what should have you liked to do? Kevan Ohtsji: I went to school for marketing communications, so probably advertising. Either that or small business, I find that I have quite the entrepreneurial spirit. Gilles Nuytens: Did you keep contact with the staff members and the actors of Stargate? Kevan Ohtsji: Just yesterday I went to a BBQ with Kira Clavell (Amaterasu). We had ostrich burgers.not bad at all! She is another splendid actor and sweetheart to work with. Gilles Nuytens: The characters you receive are generally secondary, either good or bad guys, you are often behind someone else. This is in fact generally the case for a number of asian actors. What are you willing to do to change this situation? Kevan Ohtsji: This has been the situation for most ethnic minorities. The industry has grown immensely from the ethnic stereotypes in media that existed 10 years ago. It is a constant concern and personal battle for me to help break stereotypes with media. I taught acting lessons at the National Nikkei Heritage Centre in hopes of encouraging Asian youth to the arts. I have also served on the executive boards of both the Japanese Powell Street Festival (promotes Japanese Canadian arts and culture), and the Vancouver Asian Film Festival. I have actor friends of all ethnicities whom I help, and who in turn help me. Our struggles and triumphs all share a common thread in that we are all artists, each gifted and each with our own journeys. I have been trying to write screenplays and it is my goal to eventually have one them made. Other than that, I take special care in encouraging fellow Asian artists to write films, direct shorts, produce films, and break stereotypes not by complaining about our present state, but rather by giving our all to our craft. In that I believe we can be recognized for our work as artists and not only Asian artists. That was a very good question, and I thank you for asking it. Gilles Nuytens: Before playing in Stargate did you know well the show? Kevan Ohtsji: To be honest I did not know the show well, other than understanding the general premise. Once on set I was met by a wonderful cast and crew that truly cared about what the show stood for. I give much respect to all. Gilles Nuytens: The role you are playing, Oshu, Yu's First Prime, seems to be someone who thinks and is clear-sighted. Do you have some common points with him regarding the character and the personality? How should you describe him? Kevan Ohtsji: I would describe Oshu as a person who holds honor and integrity above all. He is clear sighted, analytical, compassionate, loyal, and able to reason. These are the attributes I chose to embody Oshu with, and probably why he is my favorite character to play. These characteristics when challenged by circumstance make for excellent drama and a chance for the audience to understand sometimes there are no clear cut right and wrong choices. only the intention to do the best with what we've got today. In terms of identifying with Oshu, I believe and would hope that I personally share his noble character traits. Gilles Nuytens: In the occidental cinema, it appears that sometimes, producers uses non-asian actors to play the role of asian, it was essentially the case some decades ago but my exemple is in the movie "Crying Freeman" where you took a part. The main role was the one of a japanese but played by a non-asian, Mark Dacascos, he did a very good job in the role that's not the point but for me I find that weird and not really credible for the movie. I heard they tried to use real japanese actors but it seemed that the main role wasn't. What do you think about that and what are your feelings ? Kevan Ohtsji: That's a very good question Gilles. My feelings on this are that if the actor truly fits the part but is not of the ethnicity written, then it is justified. Take for example Ben Kingsley in the role of Gandhi, who I thought did a magnificent job and after watching his performance one was moved by the spirit of his character. Now as an Asian actor and without many leading roles written for us, I do cringe when the typical Asian martial arts star lands the dramatic role so unsuitable for him, but is handed the part because of his notoriety. And I am sad to discover films lacking in depth of story where the leading roles written for Asians happen to be about martial arts, or gangs ­ simply to sell the show. I love good mafia films, and action flicks, but I really can't stand gratuitous violence or special effects when there is no reason other than for 'effect'. One word. RESPECT. This sums up the way I feel about the occidental cinema. Replacing an ethnic actor for the sake of effect, as opposed to the sake of the well being of the film hurts the project and whittles away the integrity of the industry as a whole. I am proud to find the world has become more open and understanding of itself and the richness of different cultures in addition to the acceptance of individuals as individuals regardless of race, gender, or religion. You are a prime example of one who is open to different cultures, welcomes the uniqueness of each, and takes the time to learn of and ask intelligent questions. So with that I thank you. I thank you with respect for asking such thoughtful and provocative questions. Gilles Nuytens: Thanks a lot for this interview. I hope to see you again very soon in Stargate or in some other great movie! Kevan Ohtsji: Thank you! It was my pleasure.